Context: Inspiring youth with BFRBs just finished telling their stories at the podium. A glimpse of what has happened to Angela Hartlin since receiving treatment for her Dermatillomania (compulsive skin picking) from Karen Pickett after appearing on “The Doctors“. In releasing her memoir five years ago she never expected the snowball effect her advocacy would create. Between her involvement and the release of the 1st documentary about Dermatillomania (Scars of Shame), meeting the Trichotillomania Learning Center, and helping to launch the Canadian BFRB Support Network, she never believed she would get the opportunity to ever recover from this disorder due to there not being many worldwide resources, let alone local to her hometown in Nova Scotia, Canada. See the detailed version at her blog! 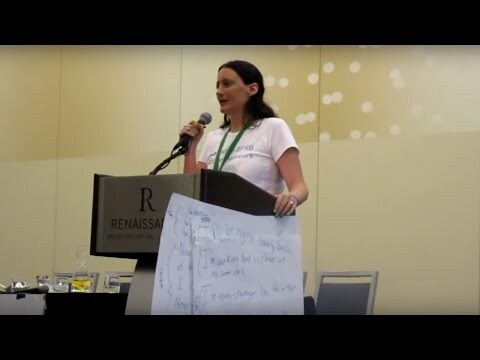 *This is the 2013 conference speech referenced, when Angela was not in recovery and didn’t believe she would ever get the opportunity to get treatment.